After going through hundreds and thousands of men’s pullover patterns, I pick some patterns which I like. I finalize one pattern which is liked by me and my hubby. With a tummy which looks more like an overgrown watermelon, I and hubby go to Surya Emporium to buy yarn. I have 8-ply yarn in mind so that the knitting will go faster and have one particular shade in mind. The store guy gives us the sad news that all the newly arrived yarn is tucked away in their storeroom which happens to be on the fourth floor. ‘Can Madam manage?’ he asks eying my tummy sideways. ‘Oh yes’ I declare and off we go for a trip up the stairs which go on endlessly. I pant and heave and finally reach the storeroom. I buy the yarn I want and head back home. I have the pattern printed out, yarn wound and the needles ready. I decide to make a swatch, the very first time in my life. After going up and down some needle sizes, I finally get the desired gauge. With this big achievement, I cast on for the sweater and knit a few rows. My tummy realizes that it can’t get any more bigger and decides to spit the little one out. The little boy arrives and the sweater is long forgotten. The hubster’s attempts at reminding me of the pullover I was planning to make for him were met with ‘Sweater? What sweater?’ Sometimes it was , ‘Hubby? Who hubby?’ He gave up after a few futile attempts. Bangalore is getting colder by the day. Hubby decides enough is enough. He fishes out the abandoned sweater, prints out the pattern and handing over the yarn, gives me a stern warning, ‘Make this for me… or else’. I knit on endlessly. I modified the pattern to knit the sweater in round. Who likes seaming, right? The cables, twists and turns are very beautiful and keeps my interest piqued for the entire duration. I complete the body in a month. It was an achievement, considering I have a 10-month old baby coming in the way. 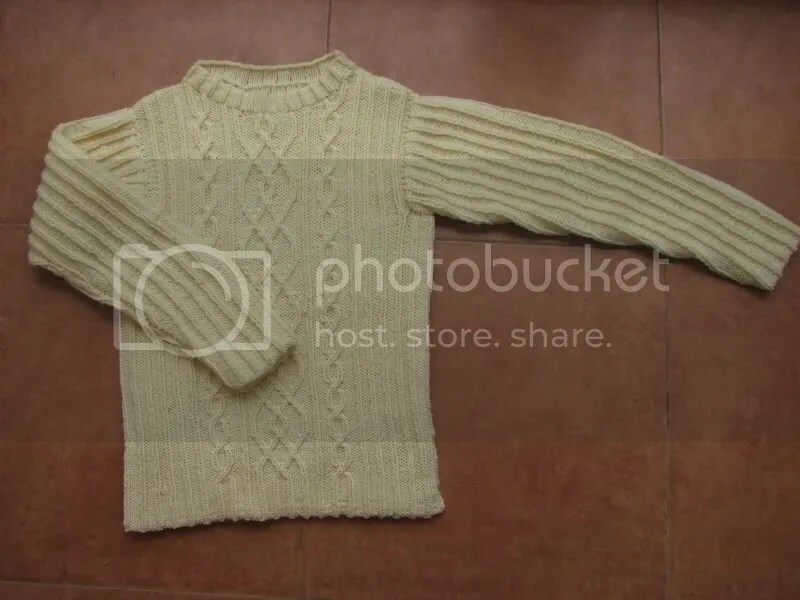 I looked at the pullover without the sleeves in awe and imagine how it would look like with sleeves. 20th is hubby’s birthday. I promise myself that I will finish the sweater for him and gift it to him on his birthday. I procrastinate over how to make the sleeves. Should I pick up stitches at the armhole and knit in round? Should I knit the sleeves in round separately and then sew them on? How about just following the pattern and knit them flat? Days were lost in making this decision. Birthday came and went and not a single stitch was added to the sweater. Another stern warning from hubby and I say ‘Let’s get it done with’. I finally decide to follow the pattern and knit the first sleeve flat. The sleeve is done and is admired. I mock attach the sleeves to the sweater and imagine how the second sleeve would look like. Another few days of laziness and another request from hubby ‘It’s really cold now. Can I have my sweater now?’ I sit down and knit like crazy and finish the second sleeve. Lest I lose the steam, I sew the seams, finish the neck band, wash and block. Phew. The pullover, ladies and gentlemen, is finished. This is a beautiful pattern. Kathy Zimmerman loves cables and it shows. The main cable panel in the middle looks complicated, but is so easy to knit. The smaller, running cables at the sides add a border like look to the main panel. 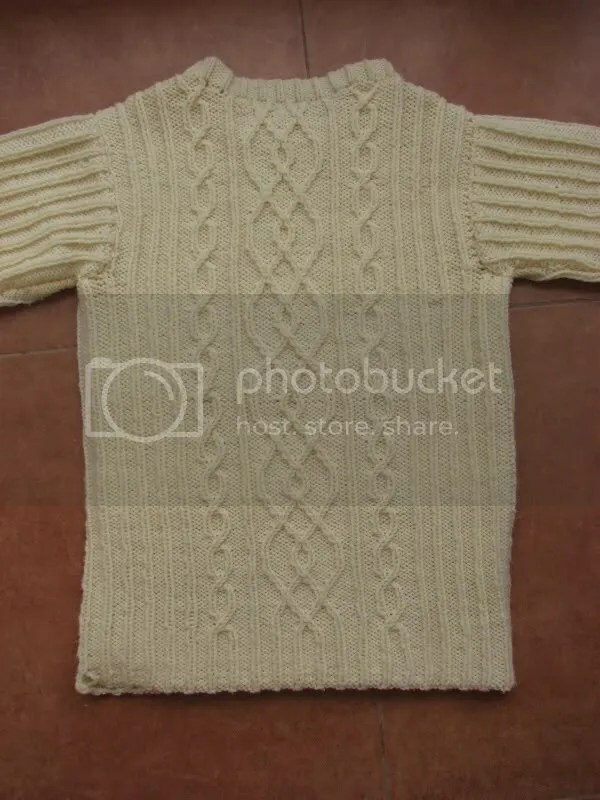 The sweater has the same cable pattern on the back too. The K1,P3 ribbing adds texture to the body and the sleeves. On the whole, one awesome pattern to knit and wear. I personally don’t like wearing cables, but that’s a different story. My husband, on the other hand, loooooves cables, so he is happy and so am I. Well done on completing your hubby’s sweater. I think you did an excellent job and it was obviously worth waiting for. That is mind-boggling work. Great great job! Sanhita, that is on the cards. Watch this space! Rima, thanks a lot! It means so much, coming from you. Bravo! What a fantastic sweater and such a great story that goes along with its making. The cables and ribbing really pop with this yarn. Great job!